I despise country music, oh wait, everybody knows that for the most part. I need to search deeper. 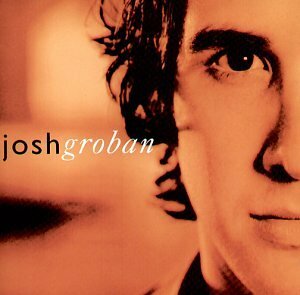 I secretly love Josh Groban and his music. I know it is lame but I love it and it makes me misty even. I also dislike well known and vastly popular rock groups. whenever I mention this in mixed company, people gasp. I'll just give you a few on the list so as not to upset the masses... Pink Floyd, Steely Dan, Janis Joplin, The Rolling Stones, Aerosmith...better stop before I really anger people. Not only do I dislike beloved rockstars, but I am also not fond of well known and celebrated actors. Again, just to name a couple because this list gets a lot of criticism as well...Andy Garcia, Al Pacino, Renee Zellweger, Keanu Reeves (except in Bill and Ted or Point Break of course), Catherine Zeta Jones... just a few, there is a longer list. Number 4's mention of Keanu Reeves reminded me of another thing I really don't like very much... 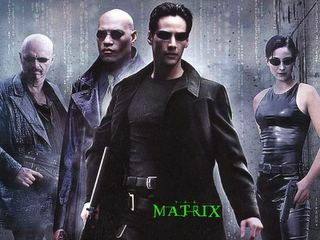 The Matrix. Sure the one movie I saw was OK, but nothing spectacular that made me want to see the other two. When I eat, I don't like any of the food on my plate to touch each other. If I could I would digress back to my toddler days and get one of those divider plates. I am obsessed with gum. I love it. I could chew it all day. Oral fixation I guess, what does that say? I hate feet. Oh wait, everyone knows that one as well. If you didn't know, I really don't like feet! I don't like to see them at all, not even my own really. And god forbid someone on a show or movie is touching them or licking......ewwwww, grossed myself out!!! I am scared of water, heights and that I will be home alone one day and someone will come in and scare me. Not rob me or attack me....just a boo! Very scarry. When I get scared during a movie...I cover my ears. I know I should cover my eyes, but I think the music is sometimes scarrier. My favorite candy bar is Three Musketeers. I can tap dance, juggle and make pig sounds quite well. I love the color pink (just recently) but green is still my favorite. I secretly wish I was more of a girly girl and 3 inches taller, in case someone has a magic lamp and wants to share. I also hate cheetos. Not really because of the taste but because of cheeto hands!! I don't think The Family Guy is funny. Sure it has it's moments, but all in all, not really entertaining to me. I secretly wish I could live somewhere really rural, not necessarily a farm because that is too much work, but a small town. I really loved Little House on The Prairie when I was growing up. When I meet a guy for the first time, I look at three things.... Hair, Teeth and Shoes. And then I judge them based on that. I know that is bad and it took some guts to admit it! I may be more shallow than I once thought...this list may be helping me realize that. Am I? I need more lists! My favorite dish in the world is Italian Meatloaf and only my mom knows what that is and how to make it, but never does. Ok, so that is probably good enough for now. I think many people have notions about me because I am a single mom and kinda a tough chick, but there is so much more to me. I don't know if I realize it sometimes because it is almost like I have been typecast in my own life and now I am stuck. This is helpful to help me embrace the ME that I really am. What do I like? What don't I like? Who the hell am I? It is quite healthy to do a self check of YOU every once in a while. So, if you don't have any lists....make one. Make two. Sometimes I forget that I need to check in with me and I am sure other people do as well. So, I know that I forgot to put a new cool blog link on my entry yesterday. Today I shall make it up to everyone who was waiting with baited breath and post two, maybe three links!! Probably two. The first, I am sure I will get crap for it but what do I care, is Zach Braff's blog. You know, the guy from Scrubs and Garden State. He is actually very amusing and because he is a writer his blog is quite good if you ask me. He doesn't post much though, but when he does, he has some great links like this one of the funniest thing he has ever seen. With the recent Star Wars craze which is upon us, I thought it would be a good time to mention this blog, The Darth Side, Memoirs of a Monster. It is the blog of Darth Vader and it is great. Well written and insightful into the mind of the evil genius. So, there ya go, more useless nonsense...enjoy.